include shortness of breath, chest tightness, wheezing, and coughing; nighttime symptoms that interfere with sleep can be particularly troublesome. These symptoms are caused by inflammation, swelling, and constriction of muscles that surround the breathing tubes in the chest, the airways connecting the lungs to the mouth and nose. The hallmark of asthma is variability and reversibility in the inflammation and constriction of the airways. Although researchers have identified a number of chemicals in the workplace that can cause asthma, the cause of most cases of asthma is unknown. Genetic risk factors are important; adults who have asthma are more likely to produce children with asthma than adults who do not suffer from this ailment. Genetic risk cannot explain the increase in the number of persons with asthma in the United States, from 6.8 million persons in 1980 to about 15 million in 1996, because the genetic composition of the population changes much more slowly than that. Whether outdoor air pollution might cause asthma has not been sufficiently studied. Although many people are afflicted with asthma, determining exactly when an individual's disease began—so the critical period of environmental exposures might be identified—is difficult. Studies comparing the overall rate of asthma with air pollution levels have not produced data showing a relationship between asthma and outdoor pollution. For example, increases in the number of persons with asthma in the United States occurred while the overall levels of outdoor air pollution were declining. Despite the overall decline in air pollution, concentrations of ozone and airborne particles with a diameter less than 10 microns (abbreviated as PM 10 ) have hardly declined at all. Nevertheless, these trends do not implicate outdoor air pollution as an important cause of the increase in asthma sufferers. Information comparing rates of asthma among children born in Germany before and after reunification in 1989 also do not support a role for air pollution in causing asthma. Air pollution from industrial sources was greater in the former East Germany than in West Germany, yet the situation with asthma was the reverse, with a higher rate of asthma present in West Germany. 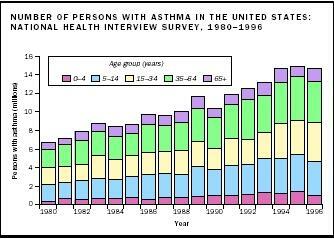 The difference in asthma rates appeared to result from higher rates of allergy in West Germany. In contrast to these studies, one recent study conducted in southern California found an increased risk for developing asthma in children who participated in team sports, a surrogate for greater exposure, and who also lived in areas with higher ozone levels. Some outdoor air pollutants, such as ground-level ozone, PM 10 , sulfur dioxide, and nitrogen oxides, can worsen asthma. Related studies compare the rate of emergency department visits for asthma at times of high levels of air pollution with such visits at times of low levels of air pollution. In a study conducted during the 1996 Olympics in Atlanta, changes in traffic patterns were associated with reduced levels of ozone and with fewer emergency department visits for asthma. Indoor air pollution probably plays a more significant role in asthma than outdoor air pollution. On average, people spend much more time indoors than outdoors, and concentrations of some pollutants can be many times higher indoors. Indoor air exposures are classified as being biological, derived from living organisms, or chemical. Because no regulations exist for levels of indoor air pollutants, concentrations of these exposures are not measured with the same frequency and uniformity as those for outdoor pollutants. Among indoor exposures, exposure to house dust mites has been found to cause asthma and, for preschool-aged children, environmental tobacco smoke has been associated with the development of asthma. Some evidence exists that exposure to cockroaches and infection with respiratory syncytial virus also may be linked to the development of asthma. Researchers have correspondingly identified a much longer list of indoor exposures that can trigger or worsen asthma: besides the above factors, exposure to cat dander, molds, dogs, and nitrogen oxides. An individual can take many steps to reduce exposure to the factors that exacerbate asthma. Basic precautions include the following: Stop smoking and avoid tobacco smoke; vacuum the home once or twice a week (but with the asthma-affected person not present); avoid mold, making sure that moisture collections are addressed to prevent mold growth; and reduce exposure to house dust mites, cats, dogs, and cockroaches, depending on which of these are allergic triggers for the asthma sufferer. The importance of air pollution, whether indoor or outdoor, as a cause of asthma remains a subject of intense study. Exposure to house dust mites appears to be capable of causing asthma and environmental tobacco smoke has been associated with the development of asthma, but evidence linking these exposures to the increase in asthma cases is lacking. SEE ALSO A IR P OLLUTION ; H EALTH , H UMAN ; I NDOOR A IR P OLLUTION . Committee on the Assessment of Asthma and Indoor Air. (2000). Clearing the Air: Asthma and Indoor Air Exposures. Washington, DC: National Academy Press. Pearce, Neal; Beasley, Richard; Burgess, Carl; and Crane, Julian, eds. (1998). Asthma Epidemiology: Principles and Methods. New York: Oxford University Press. National Asthma Education and Prevention Program. (1997). Facts about Controlling Your Asthma. Bethesda, MD: Public Health Service. Available from http://www.nhlbi.nih.gov/health .